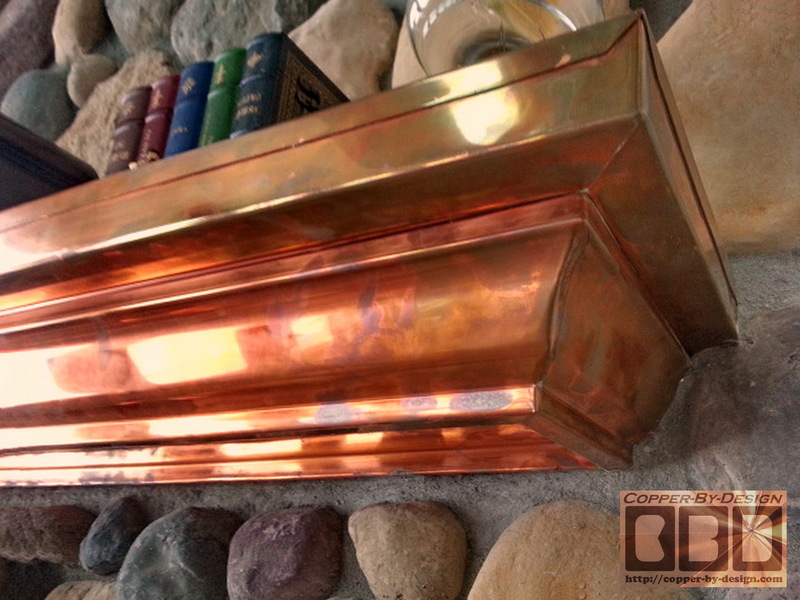 At CBD our main product-line has been designing and fabricating custom exterior rain management products, and these copper clad mantles are especially good for exterior applications subjected to the elements, where varnished wood or other materials would not hold up nearly as well. These are also used for indoor application for a nice clean look that can resist scratches and the radiating heat better than any painted or lacquered wood. Also, soot can be scrubbed off with less worry about harming such a delicate surface. 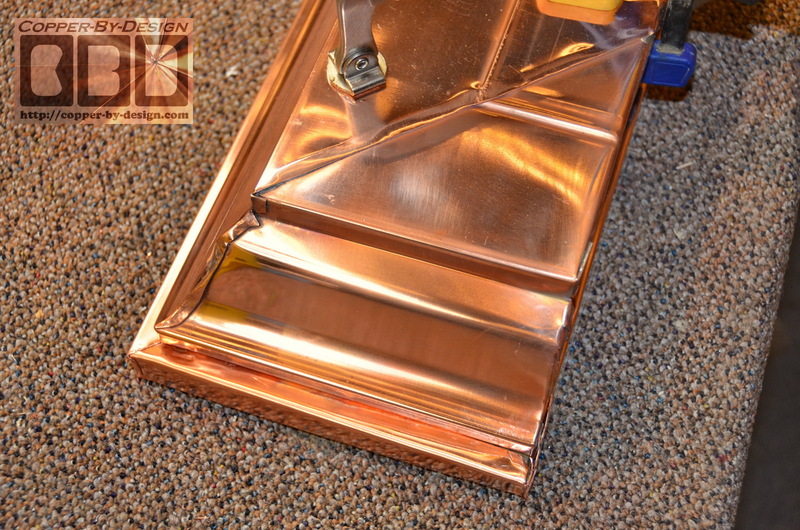 Copper also has the added benefit of being 10X more anti-microbial than other surfaces like a plastic or stainless steel, so other than dusting it off there is no cleaning required. 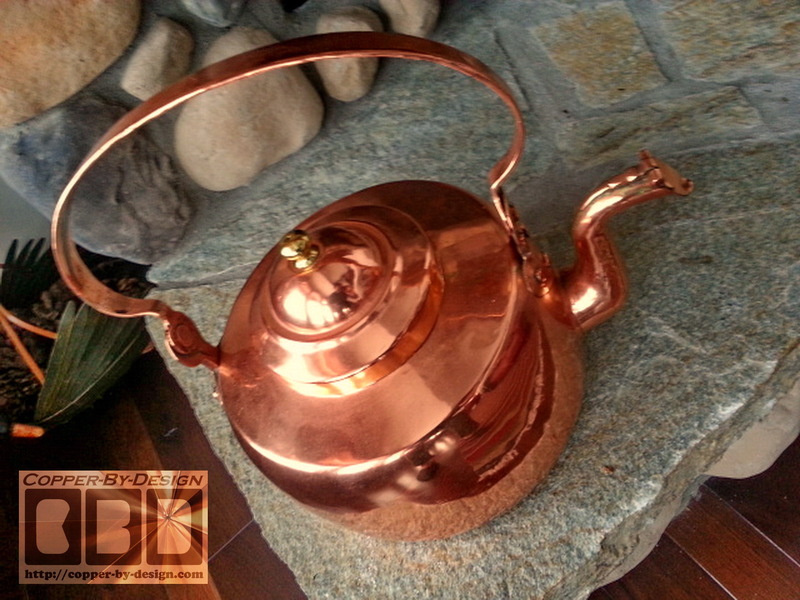 Another advantage of copper is how if you decide you do not like the look of the patina it develops over time it can always be polished back to the new copper look to start over, or experiment with different chemical treatments to achieve the desired look. 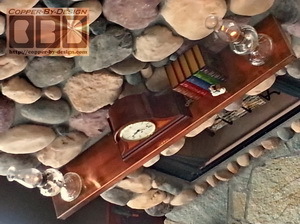 Below you will find several examples of the mantles we have built for clients over the last decade. Keep in mind you are not limited to just these styles shown. 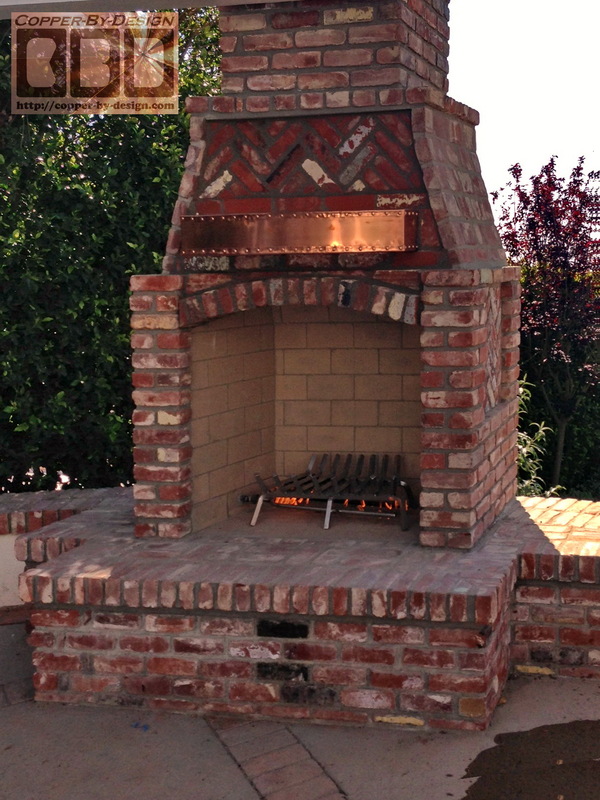 Custom work is our specialty. They are listed along with the price they had paid at that time, including the cost of a crate and freight charges when they are not local to the Portland Oregon area. This way you can get a good realistic idea of what we charge before you need to contact CBD for a quote. This is more information than you are likely to get on any other web site, so I hope you appreciate my transparency here. When contacting me for a quote please be as specific as possible to let me know just what size and style you want, so I can calculate the cost for your unique project. There is no discount for just copying a previous project. 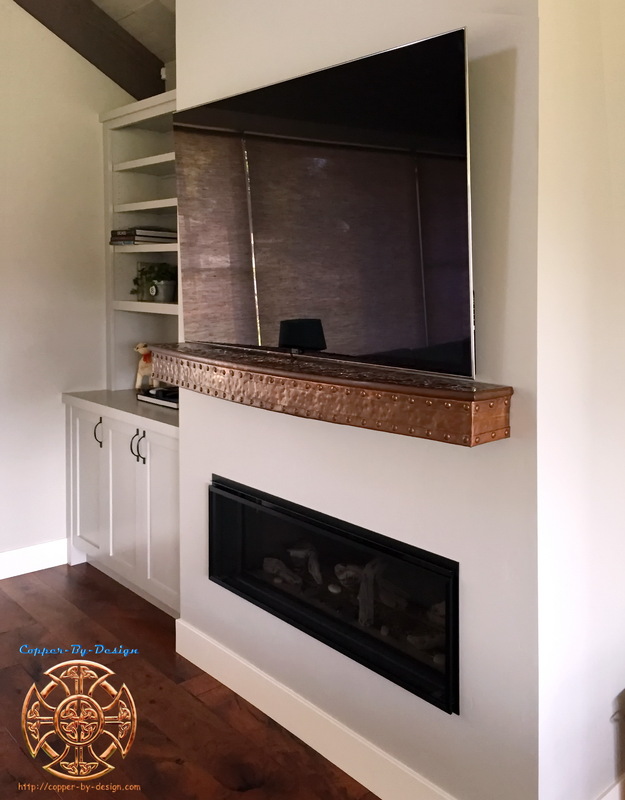 There are numerous ways to go about building a custom mantle for you as to the size and style taken into account, but this still needs a solid wood or concrete base inside to resist denting and give this a good solid feel. This will also need a firm attachment, which is sturdy enough for an adult to sit on the mantle, so there is no risk of this becoming dislodged. I will help with the design this mounting system that is also not too complicated. 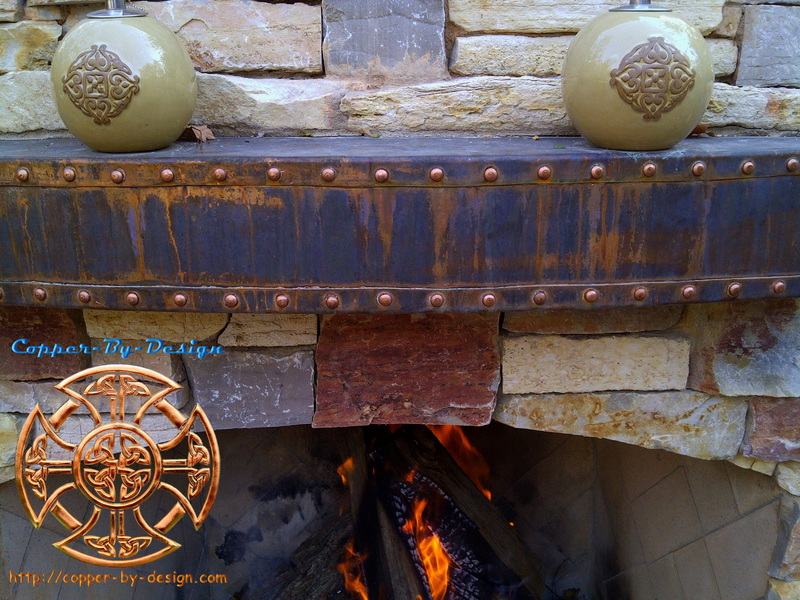 For a more rustic look some clients have us add a patina and or texture the copper with a hammered look. 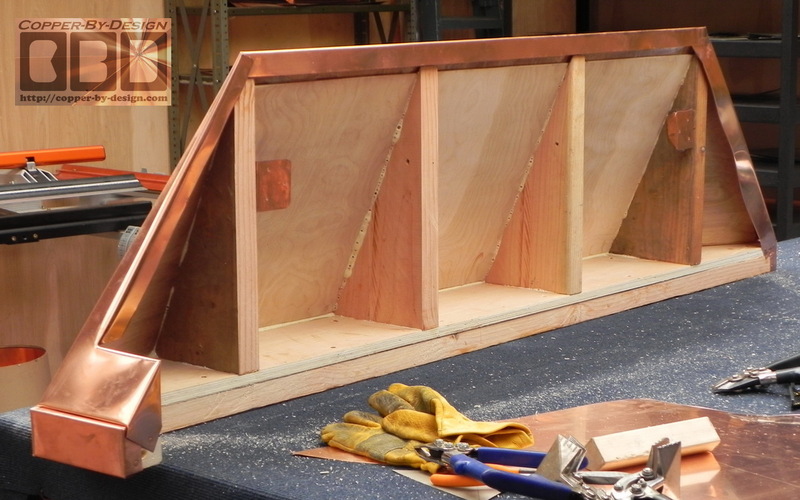 as well as adding a string of copper domes to resemble large rivets, as seen in steel bridge construction. 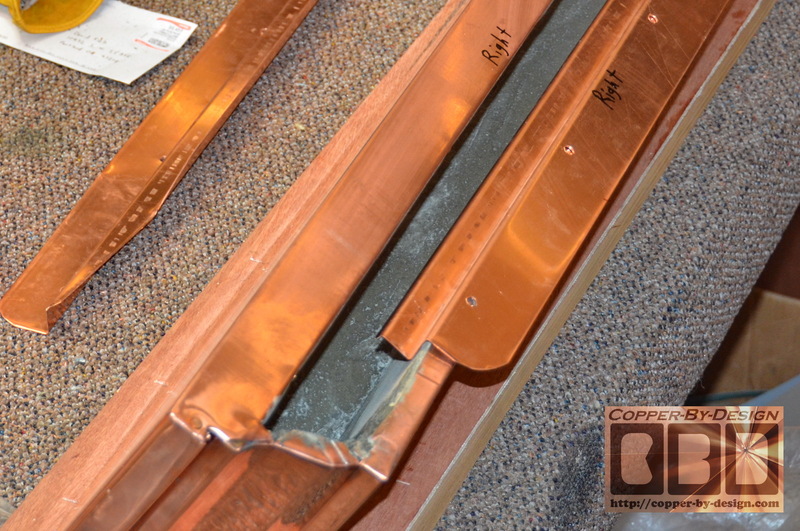 The main benefit of a hammered copper surface is so that future dents and scratches are not nearly as noticeable. 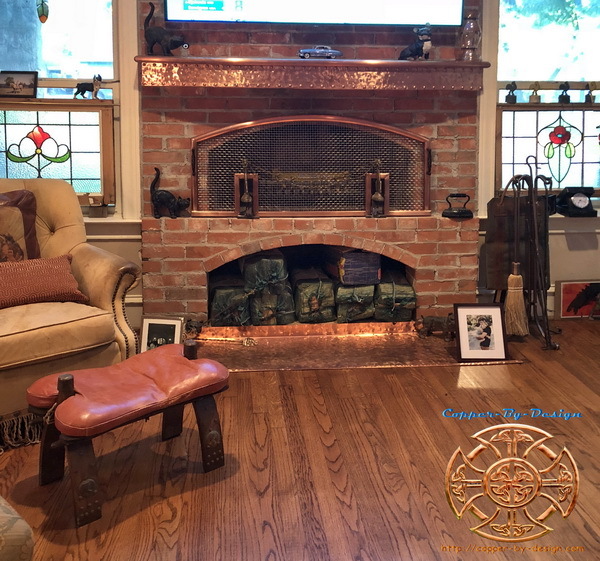 This is done before adhearing the copper to the wood substructure for a more rustic look at an added cost of $20 per square foot for each treatment: patina or hammered. 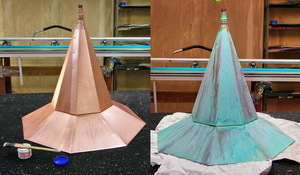 The domes can be made different sizes and tend to run $2 each installed. For sizing you would do well to form a temporary mantle to test fit in place to get a better feel for the size that would best suit your needs. This can be done with scrap wood or just cardboard box scraps cut and taped together to fit the different sizes. 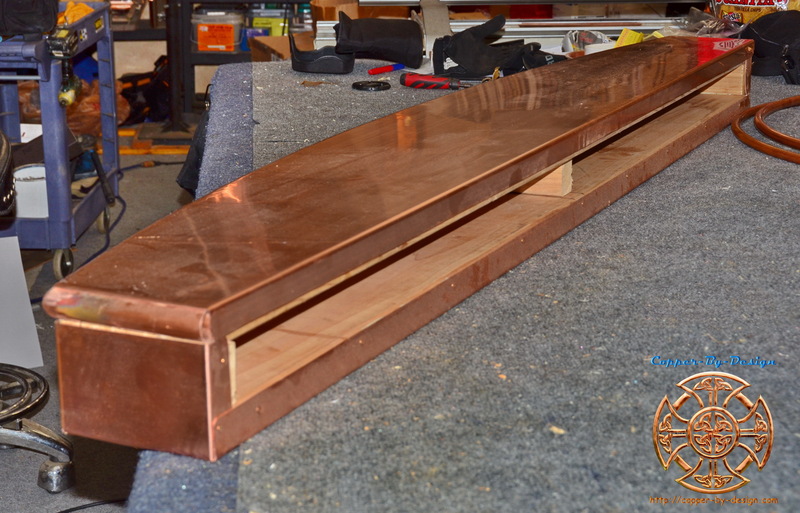 Once we have built this in copper it is pretty much set, so anything you can do on your end to figure out the best size is a very important first step to your long term saticefaction. I would hate for you to get it mounted and not be happy with that size you had asked for. 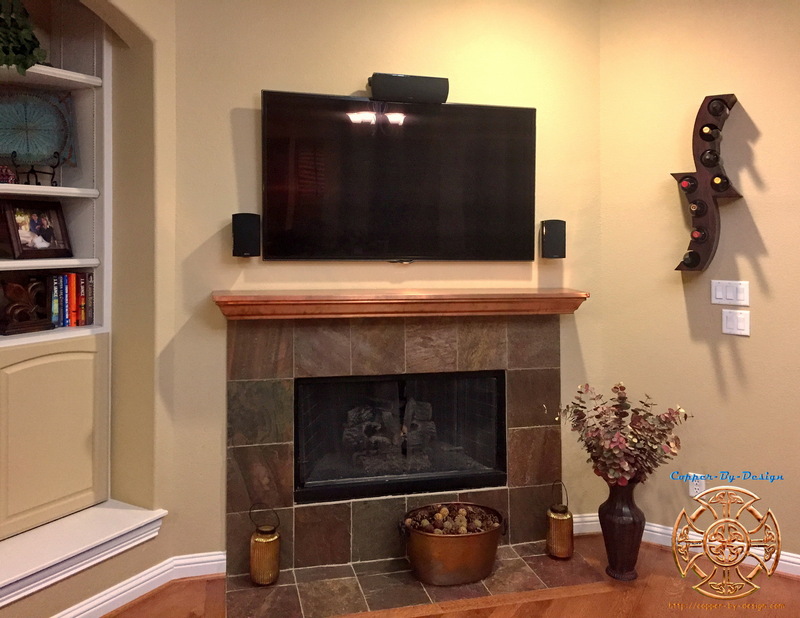 It is very important to have worked out a sturdy attachment for any mantle, which is not too complicated to install and change with a hidden from sight bracket, if possible. I will do my best to help you out with this design and even make you a wall brace to set this onto, but I will need to know what it is that we are attaching to, or what support there are behind the wall for anchoring the wall brace onto. You may need a studfinder to list the placements, so I can predrill the screw holes for you. As for the cost; these run between $100 to $300 per linear foot. This depends on the size, style, and if it will need a crate with truck freight to be shipped out of State from here in Oregon, so this cost can vary widely. We will need you to be as specific with these details for me to offer you a specific cost quote. A set of photos and description of where this is to go will also help, so I am not just working blind. Personally I rather like the look of new shiny copper, but aesthetics is very subjective. Even indoors copper will gradually turn a satin brown just from the humidity in the air and the oils from finger prints will make it spotty. 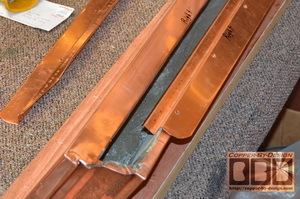 Raw exposed copper is thought to be a living finish; in that it is ever changing. Most of the work we do is for exterior rain management products, so the finish of the copper is not much of an issue, since it will patina soon enough, but indoors this process is a great deal slower. 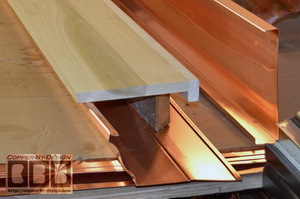 The copper we have access to is not polished, and will have tiny scratches in it, and perhaps a few small dents, as with anything hand-made, which cannot be made machine perfect. 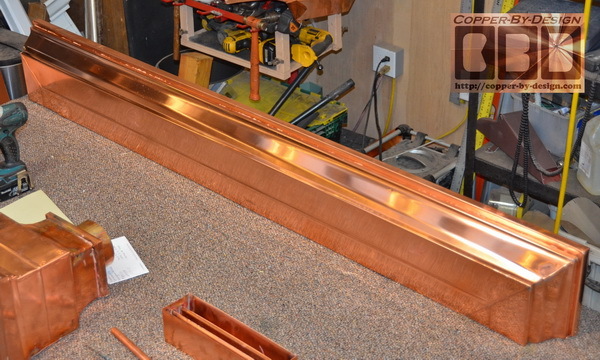 It is a lot of work to polish this copper to a mirror finish, which has not been one of our specialties, so I cannot guarantee the finish will meet your satisfaction. That said; you will need to be a bit flexible with us on this detail. 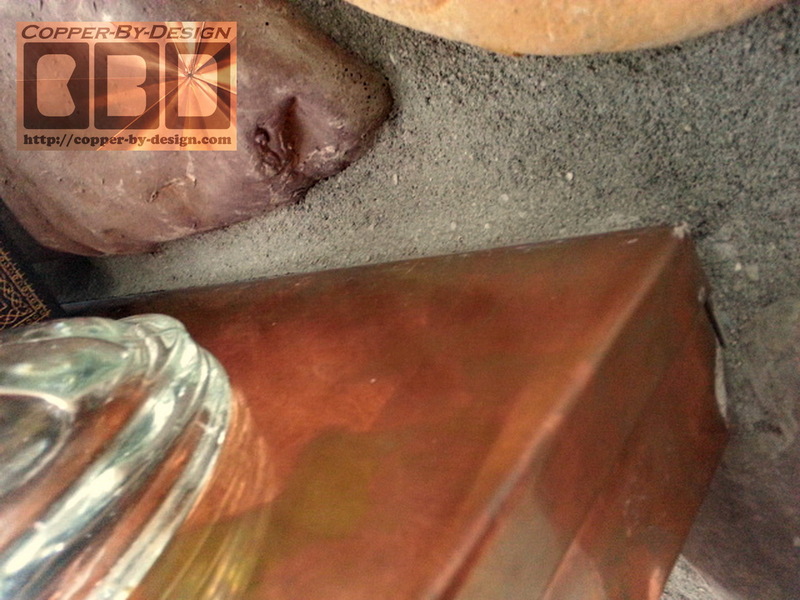 Copper can be polished at any point of it's lifespan, so imperfections is something you will not be stuck with. As long as you are willing to have it worked over until it meets your satisfaction. That's just not a service we provide. 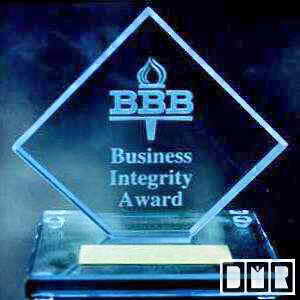 Especially for out of State clients, which is the majority of our sales. Numerous Clients have ask about having us hammer, color, or patina this copper for an antiqued rustic look and also hide any new scratches or dents that may occur. 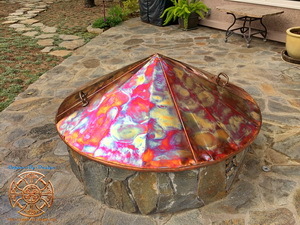 There are numerous chemical combinations to get different colored patinas, or copper can be heated up with a torch to get some interesting random rainbow colors on the copper surface, as seen in this photo. If you want this desired look not to change it would then need to be covered up with a clear lacquer over it to retain that specific look. Although, the down side of this is how that soft plastic coating will get scratched up a lot easier than the harder copper surface. Also, it will eventually crack and peal over time or heat exposure from the fireplace in use. Making it look terrible. It also looses the advantage of the natural ability of raw copper to kill germs on contact. After discussing the pros and cons of this our Clients often decided to forgo that costly option, as it may take numerous tries to get the desired look. Which I would need to charge for all that time required for each attemped patina, and repolishing to start over if you are not satisfied with that look you see in the photos I share with you. If you are not local to us we will share progress photos of your project as we go, but as you know that may not properly represent how this may look in person. If we get the tone you like it can be waxed to retain that look, but that would need to be reapplied frequently. 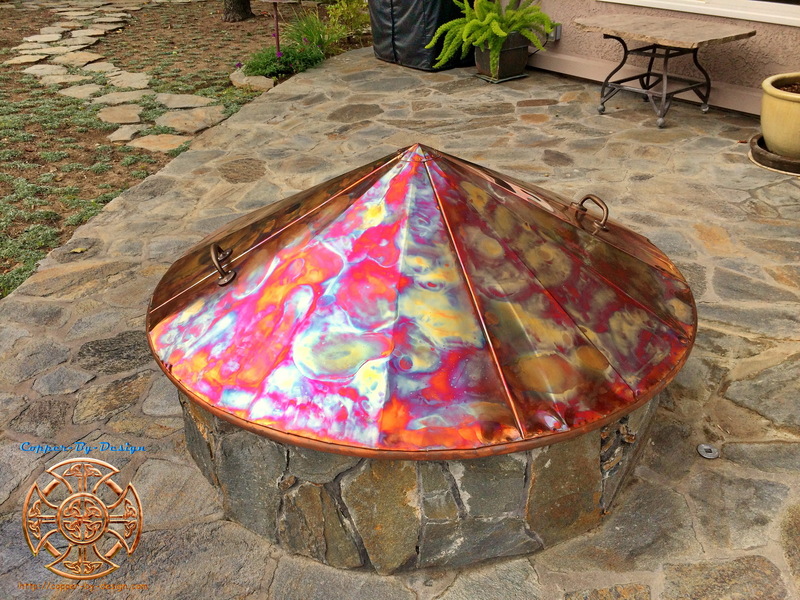 Finger prints will make the copper turn darker in a spotty manner, but that can also be a rustic charming look some Clients like. If at any point you decide you don't like that look it can be stripped and polished again to start over and find the look you like best, but this can be a long drawn out process requiring your personal attention and on-site inspection. An expensive PVD coating or gold gilding is the only type of good lasting scratch resistant coating I know of to retain the new look of copper or brass; as with the better door knobs. Although, large projects like this may cost more to coat than it costs to make and ship it. That runs about $100 per square foot. 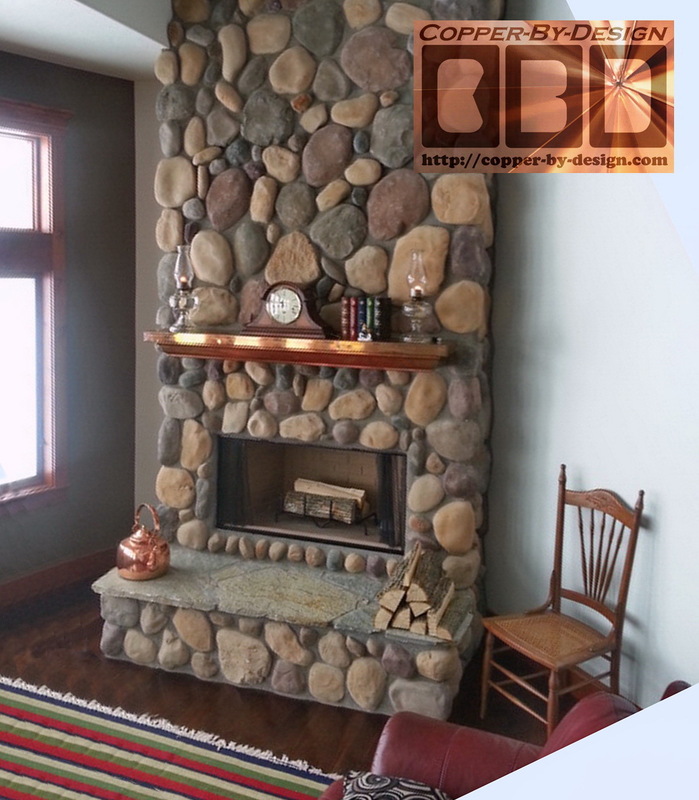 Most of the work we do is custom to order, so feel free to ask for any variation of the examples shown below, which shows the diversity of what can be done to build your needs and desires for this project. Even if your needs are different than what is shown on these pages I am happy to help brainstorm solutions, design, and fabricate nearly anything you may want. As you'll see most of my client are not local to us, so I do ship orders all across the Nation as well. Don't be shy and write me an e-mail to ask if we can help with your project. This project was for a pair of mantles 66.5" and 68" wide clad in 32oz copper with a pair of 24oz copper cinder trays and spark arrest screen custom designed and built for Tomas Collins in Dalas Texas to be mounted over their fireplace to help shield the heat from their flat screen TV just above it. 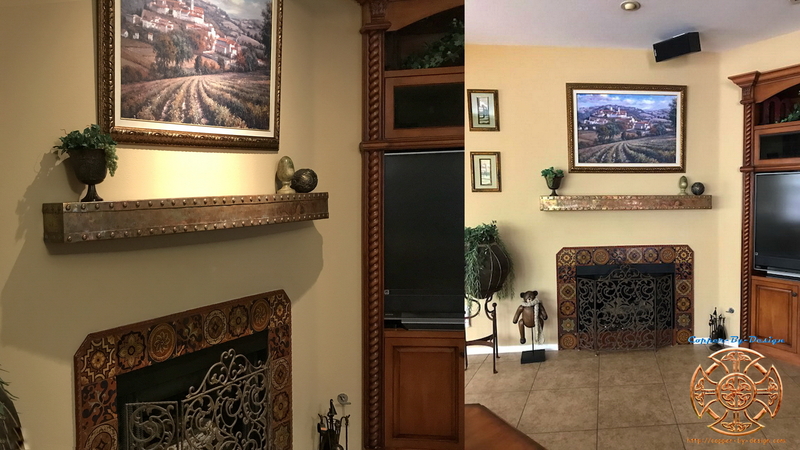 I shared dozens of photos with this Client as we worked on this project to help communicate how this was progressing and get their feedback along the way. We still have the spark arrest screens to finish. The size of these are 6" tall X 66.5" & 68" wide and 9" deep in the center narrowing to 5" on the outside. The spark arrest screens were quoted at $910 each. 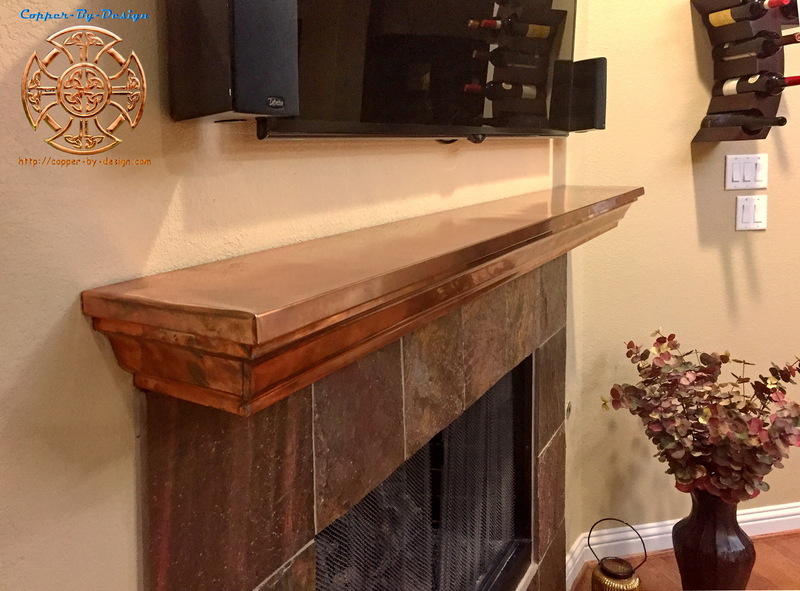 This is a 60" wide mantle clad in 32oz copper custom designed and built for Brian & Jodi Moriguchi in Stevenson Ranch, California to be mounted over their natural gas fireplace insert to help shield the heat from their painting just above it. I shared 20 other photos with this Client as we worked on this project to help communicate how this was progressing and get their feedback along the way. I had not done much pre-tarnishing of the copper for clients, so this was a bit of an experiment to see what we could achieve in a short time-frame for an interesting organic look. 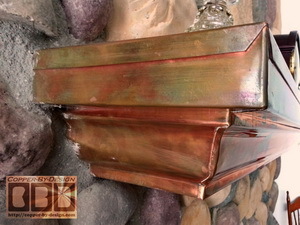 This custom indoor 32oz copper covered fireplace mantle piece I made for Ann Rosen in New York State. 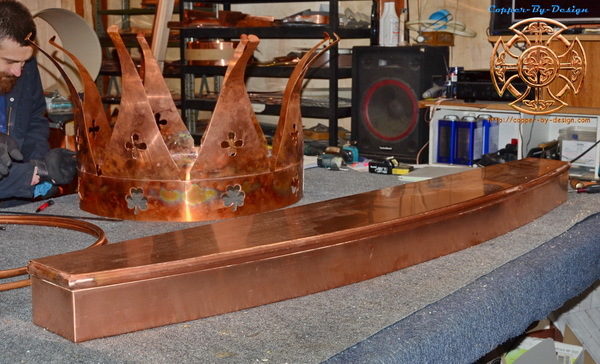 The crown behind it was for a chimney cap project going to IL. They just wanted a clean smooth look, so they went without the hammering and rivets that have been so popular. The copper has been glued to the wood with an expanding polyurethane glue. This custom indoor 32oz copper covered fireplace mantle piece I made for Damian Varni in Napa, California. Beside the classy look this is to help minimize the radiating heat from the natural gas fireplace insert below their flat screen TV mounted above. I hope that everything is going well up in Oregon. After six months, my finish carpenter finally made it over here this week to install the mantel. I have attached a couple of photos. 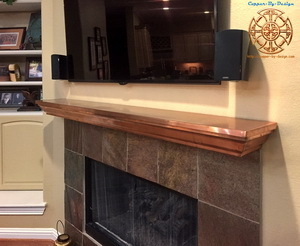 My carpenter ended up using two pieces of L shaped heavy gauge steel to mount the mantel. 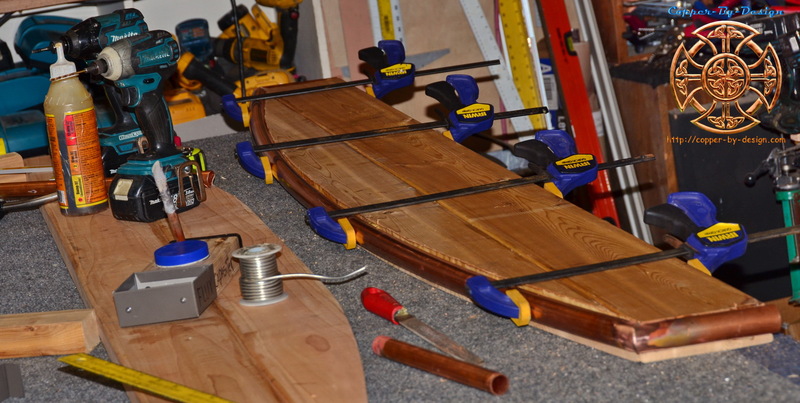 He drilled two holes in the lower part of each L and bolted those to the studs on the sides. The upper part of the L acted as a sort of ledge for the mantel. 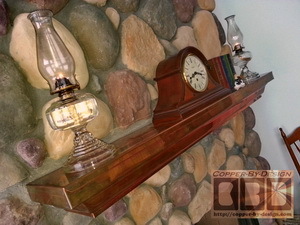 He cut two grooves in the copper on the back of the mantel, and we just slid the mantel into place. It is not going anywhere. My wife likes it, and it seems to deflect the fireplace heat as we had hoped which will protect the TV. I might move the television up an inch or two for better spacing, but we will see over the next couple of weeks. Thanks for making the mantel. It is a nice looking piece. 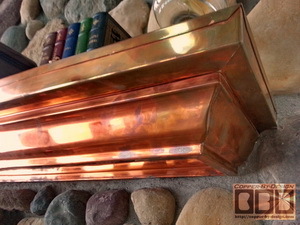 This custom 32oz copper covered fireplace mantle piece was made for a Jed Nagel in Torchlake, Michigan for over their fireplace with larger river rock around it. 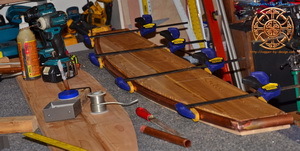 This was made with a poplar hardwood board inside for support and dent resistance. 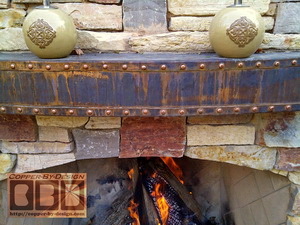 I also supplied them with a thick copper wall brace and the SS lag screws for a sturdy hidden mount slid sideways. This was made with a 2" thick top shelf board with more over hang out past the crown molding than usual. These are photos the client sent us of this installed to share with you. 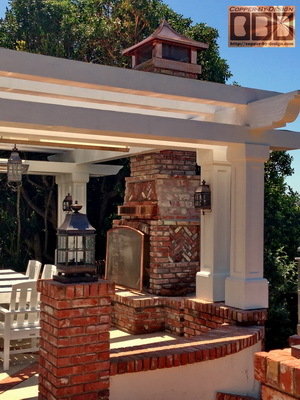 This custom outdoor 32oz copper covered fireplace mantle piece I made for Albert Rossi in Palos Verdes Estates, California. 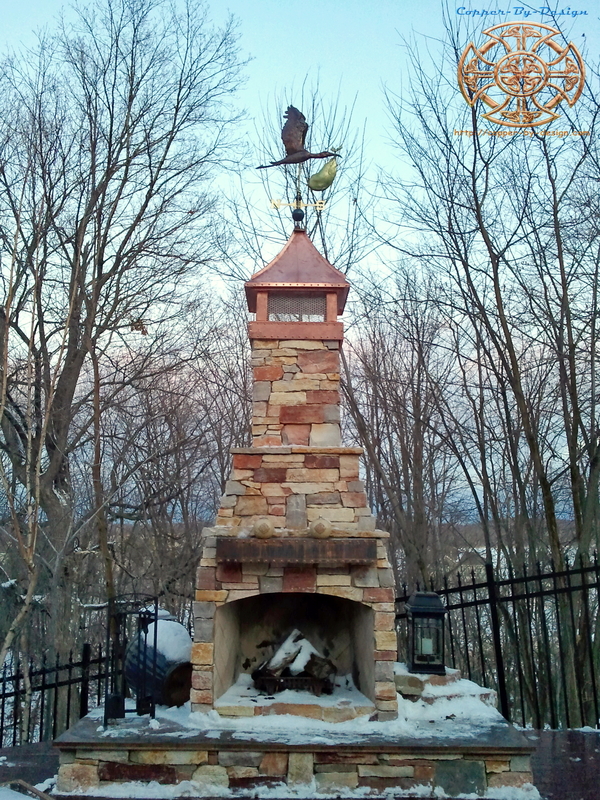 He loved the chimney cap and mantle set I made for a client named Chris & Christine Sarkinen in St. Michael, Minnesota shown below, so he also had CBD make them a chimney cap and fireplace screen. 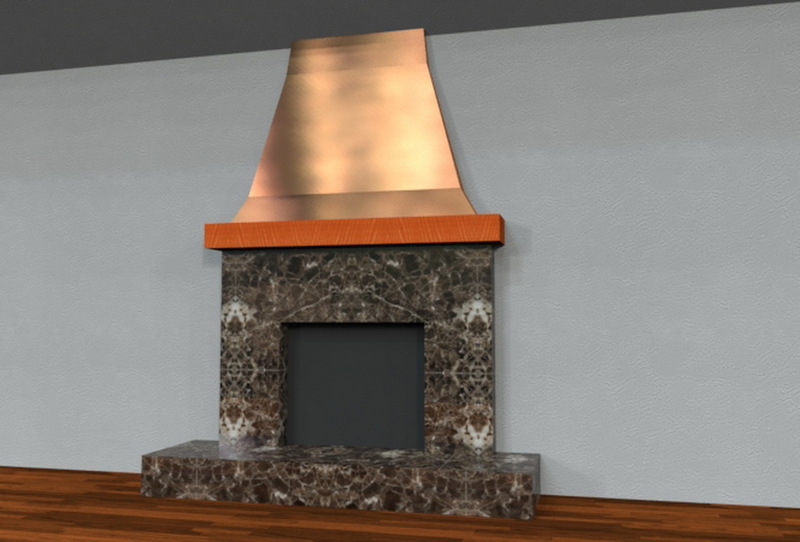 This custom 24oz copper covered fireplace mantle piece I made for Steve Garvin in Hooks, Texas for over their flush mount gas fireplace with a large flat screen TV mounted on the wall above it. He just felt it was missing something. This was made with a poplar hardwood board for support and dent resistance and I filled the crown molding with a concrete mix. I also made a wall bracket made of a thick 32oz copper to mount on the wall into the studs with SS screws I supplied for an easy sturdy hidden mounting. This can be made with a thicker top shelf board with more over hang out past the crown molding. 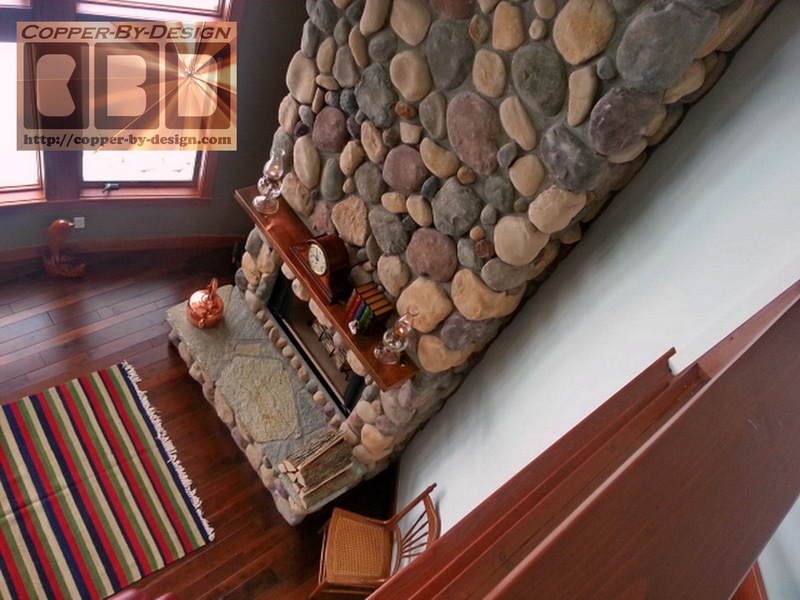 Even angle cut outwards for a more dramatic look. 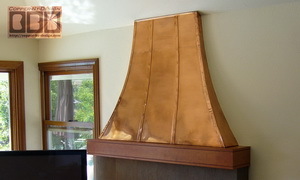 This custom copper fireplace mantle shroud cover I made for a contractor in California for his client. 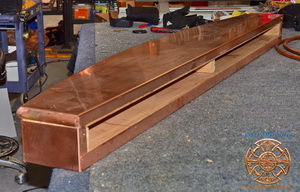 The first image on the left shows the wood structure I made for the copper to be attached to for better dent resistance. The angled copper cover was made in 1 single seamless piece. The straps are merely decorative. This custom outdoor 32oz copper covered fireplace mantle piece I made for a client in Saint Michael, Minnesota for their back yard fireplace he was building. 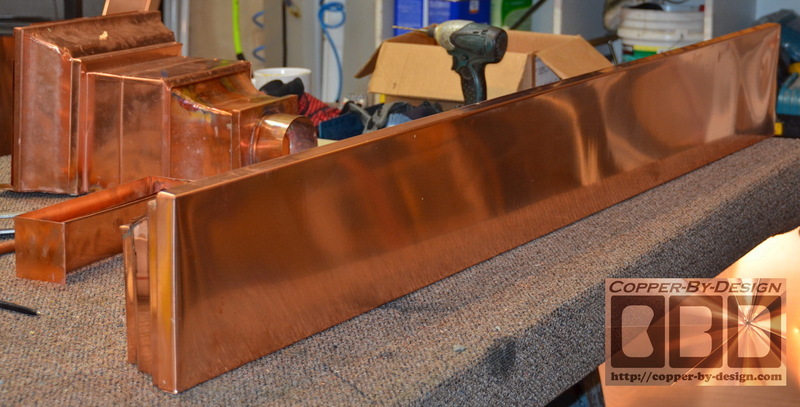 This image shows how they paid me to beat the flat copper sheets up with a hammer to give it this rustic distressed look they were after. 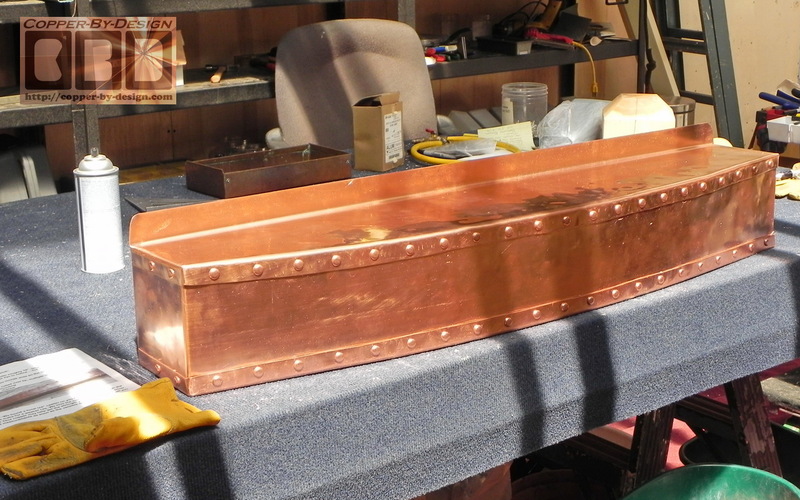 This was made with a pair of 2x8 boards cut with this convex curve and covered with 32oz copper with large industrial looking rivets. 2" of the back was covered with stone work, so only 6" in the center showed. Our client Chris Sarkinen sent us these photos over a year later (10/11) to show the rustic look of the tarnished copper this has now. He is quite pleased with the results. They also had us make a copper chimney cap for this flue, along with other custom copper pieces. If you do find this information very helpful, feel free to send us a $ tip for the assistance we so freely have published on the web here for your benefit, like you might tip a waitress. Heck, send us a gift certificate for a candle lit dinner for two.